Mocha Spoke has long been our favourite coffee shop on the island of Grenada. Not just because we’ve become great friends with the owners, but because it’s just a cool place to hang out and meet people over a steamy cup of joe. The cafe is unique to the Caribbean because it is a coffee shop / bike shop (although the owners Darryl and Marc, like to think of it as mostly a bike shop). They repair bikes, rent them out, sell their own brand of them (Concepcion), ride them, talk about them and absolutely love them. 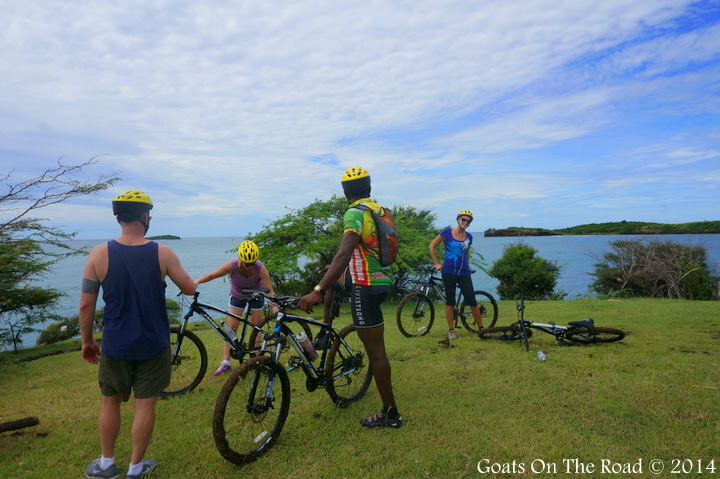 A cycle trip with Mocha Spoke is one of the top things to do in Grenada. Darryl even has his own blog called LovingTheBike.com and paired with his passion for coffee, I’d say he’s pretty much figured out how to find happiness in his work. He also enjoys a level of freedom and location independence in his tropical life, which makes him quite an inspiration to us (more on Darryl’s unique paradise lifestyle in later articles). 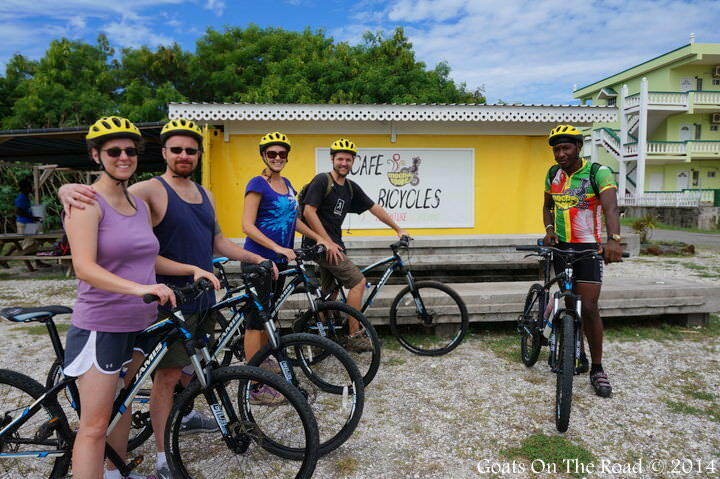 The reason we were at Mocha Spoke on this fine, cloudy, Thursday morning was to go on the South Grenada Bike Tour! Something we’ve been wanting to do for quite some time. Darryl set us up with the nicest bikes we’ve ever rented (I guess you don’t get crappy 1 speeds when you’re dealing with a cycling enthusiast! ), and we were off. Don’t miss this quick video of our bike trip around South Grenada! Two other guests were joining us on the tour and our guide Troy was friendly and experienced. He has competed in some grueling Grenadian bike races and it shows in his legs. My thighs looked like skinny little toothpicks next to his, which had a likeness to tree trunks. I think he was confused as to why I kept eying his legs when we set off on our tour at around 10:00 am. The trip was great and we didn’t spend too much time on busy roads. Troy took us up into some off-road areas around the airport and to a couple of beautiful points which had views out to the smooth Caribbean sea. Recent rains made the trails pretty muddy, but the bikes were definitely up to the challenge (more so than Dariece and I). It was a cloudy day, which didn’t make for the best photos, but we were thankful to not be riding under the scorching tropical sun. 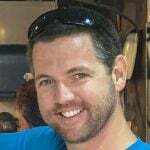 Troy was really aware of where we all were at all times, kind of like a protective school teacher taking a kindergarten class out on a field trip. It was definitely a good thing though, because a couple of times I was riding in the middle of the road, trying to get a good video shot, and Troy had to warn me that a car was coming. You see… we risk our lives every day for the content on Goats On The Road! On the way back to Mocha Spoke, we stopped at “the coconut guy” for some delicious, fresh coco-water. We’ve spent a lot of time living in the tropics, so we’ve had our fair share of coconuts, but we learned something new from this particular coco-dealer. After we finished drinking the sweet, nutritious water, he cracked the coconut open so that we could eat the inside “jelly”. The interesting thing was, with one, precise slice, he cut a perfect spoon out of the hard shell of the coconut, which we could use to scrape out the soft flesh inside. Amazing! By the time we got back to Mocha Spoke, we were reminded that we haven’t spent much time on bikes lately. Even though the tour was just two-and-a-half hours long, we could feel the burn in our thighs, wrists, and especially our butts. 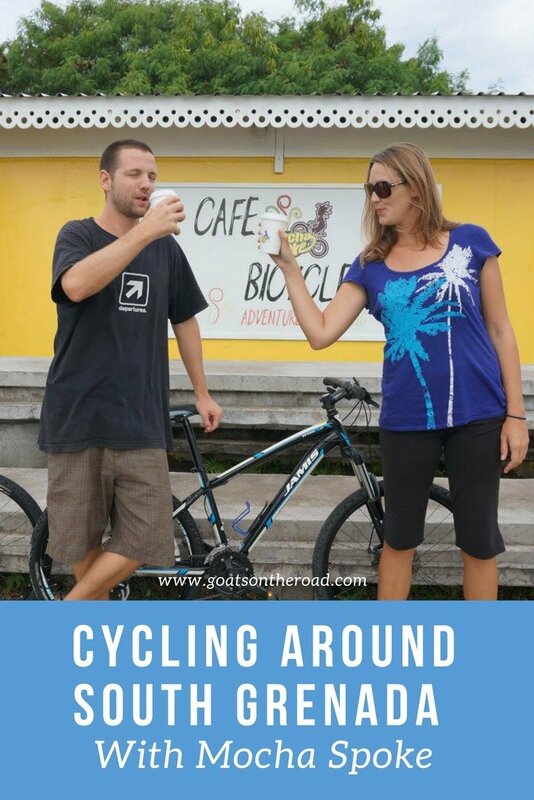 Darryl and Marc offer lots of different tours and trips for all skill levels, but I think the South Grenada Tour is perfect for cycling beginners and those who don’t spend too much time on a pear-shaped seat. When we got back to the cafe, we felt great and we were ready for another coffee. 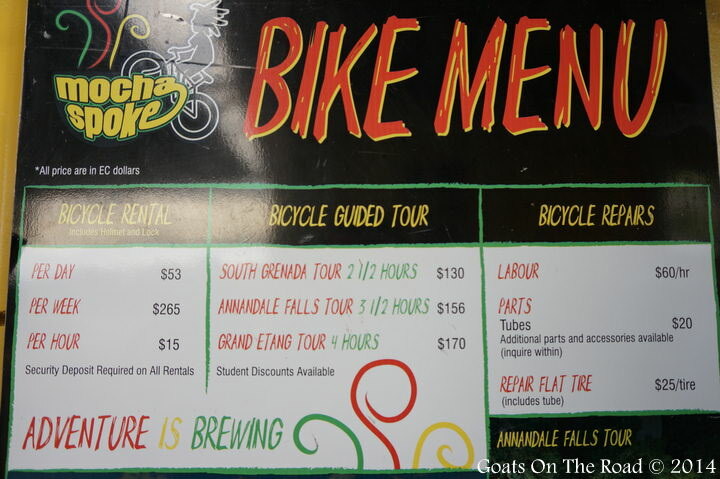 If you’re ever in Grenada, definitely head to Mocha Spoke and talk to Darryl and Marc about the bike tours. They’re not only a great way to peel yourself from the postcard perfect beaches of Grenada, but they’re also perfect for getting some exercise and seeing parts of the country that you would otherwise miss. This is one of the best things to do in Grenada for sure. If you’re not interested in cycling, it’s still worth heading to the cafe to meet people over some tasty lunches and mouth-watering waffles! There’s a great social vibe there, it’s close to the university and it’s loved by foreigners, expats and locals alike… oh, and the coffee is damn good too. Mocha Spoke is located just off the road going towards St. George’s University. Once you pass Options, look for the black rock road on the left and the sign with an arrow pointing to the location. Turn left onto the rock road and you’ll immediately see a bright yellow and white building. It’s easy to find, but if you get lost, call them on the number below. 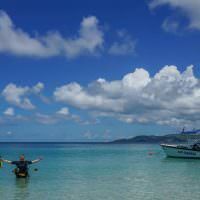 Click here for more articles from Grenada. What a brilliant way to get around the island! If we ever find ourselves in Grenada, we’ll be sure to hit up a tour with these guys! You should try a motorbike travel as well, you will definitely love it! We do love travelling by motorbike 🙂 We’ve only gone on scooters or smaller bikes though. Cycling is a great way to see a country slowly though and also to get some much needed exercise! haha. I really hope you make it to Grenada, you’ll love it 🙂 The tour is awesome because the groups are small, the bikes are really good quality and the guide was super cool as well. Oh wow I really love guided bike tours! I have been to some good ones, and now I’m seriously thinking about ditching my job and going on a world bike tour… it has been a lifelong ambition! Any advice for me, dear? Awesome adventure and lovely place, I see!!! 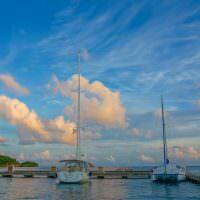 I love South Grenanda as it offers amazing places for riding a bike. Loved your post guys! Cheers.